About six months ago, I was walking through the double doors towards the gastroenterology department of the hospital building I was in, my baby cradled in one arm as I navigated her stroller with the other. She rarely sat in the stroller; she was usually crying unless she was in my arms, and even then, I had a hard time keeping her somewhat content. An older woman with a sweet smile and white hair walked through the set of doors in the direction I was coming from, and stopped to ooh and ahh at the baby. I nodded and smiled, and allowed her theI am failing at this job. pleasure of cooing at my daughter before continuing the path I had been taking. I didn’t need to see the chart to know that my baby was miserable. In that moment, between the escalating months of intense crying, constant spitting up, extreme discomfort and now, a baby that was officially not growing how she should, I felt like the word “failure” was more connected to me as a mother than to anything else. I have one job, I told myself as I listened with half an ear to the GI talking about possible tube feeding and stool samples. I was given this child with the sole goal of being able to feed her and help her develop in the best possible way. I am failing at this job. I held back a torrential wave of tears and then, when we had rehashed some kind of plan for the next few weeks that I knew would not help in the slightest, I stumbled out of the office and into the blinding Los Angeles sun. The weeks and months that had led up to and that followed that visit were more or less the same; I don’t want to go into details about the feeding journey we navigated with our third daughter. We spent hundreds, probably thousands, of dollars between lactation consultants, various formulas, homeopathic doctors, craniosacral therapists, tongue- and lip-tie providers, and various random healing methods (probiotics, digestive enzymes, anti-acid medication and more). Nothing seemed to stop her from spitting up about 20 to 25 times a day and from being extremely unhappy. As time went on and she got older, I could see that she was a good-natured, happy baby, and that it was her reflux and eating difficulties that held her back from being an otherwise very easy child. But up until very recently, even three weeks ago, my baby controlled my life; she was especially difficult in the evenings and during the night when her reflux would prevent her from being able to settle for more than an hour, maximum two, at a time. I couldn’t really go out then because sometimes she was so hysterical that only I could calm her. I quit my job, finding it too stressful to be working in a hectic work environment and then dealing emotionally and physically with a high-needs baby. I told myself to accept that right now, this was my purpose—being there for my daughter until she had passed this phase—but sometimes, I couldn’t help but feel trapped. “This baby controls my life,” I told my husband once. “It’s like I need to put everything else aside and be there just for her.” It was a hard time, but the small steps of improvement kept me sane and hopeful, and I kept telling myself that it’s just a very difficult phase that will one day be a distant memory. Throughout this challenging time, even as I grew resentful about my milk and the way it was failing my baby, and searched for a formula that would agree with her, it irked me to read articles about what seems to be a new, trending topic—women choosing to not have children. Comedy skits and jabs at life without kids being blissful and problem free ... equating women with men and their ability to focus solely on career and money without being “hindered” with other responsibilities. And I get it. Oh boy, do I get it! From the get-go, putting our bodies through the process of childbirth is excruciating. And perhaps I shouldn’t say it, and my mother tsk’s admonishingly when I do, but I don’t like being pregnant. Writing those words fills me with much guilt, and I don’t say it to downplay the challenges of those struggling with fertility; I say it if anything because I am so much weighed down with what I know is an absolute privilege and responsibility, and that mental weight is a source of great anxiety for me when I am going through the process of bringing a child into this world. Who am I to be chosen to carry this soul? Who am I who has been granted the opportunity to do what so many are struggling to do? 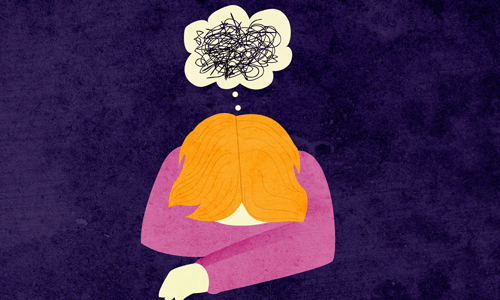 What if G‑d will challenge me with a miscarriage, or my biggest nightmare, a stillborn? I hate the unknown, the lack of control, the worry about what is to come. My pregnancies are almost an ode to my fears—each one a different saga of stress and problematic tendencies. Being a childbearing woman is limiting; it isTruly, I am blessed frustrating; it is daunting. I struggled, I still do, with the vying forces of feeling lucky and feeling resentful about my status that ties me down so. But at the end of the day, I can’t help but point out that women are built differently to men; our bodies are made to create a human, and this is something that G‑d devised in His wisdom ever since He created the world and made Eve become the first woman to go through pregnancy and childbirth. Last week, my friend had a set of twins after a long and difficult pregnancy. A week later, she almost lost her life when a series of terrifying events had her rushed to the hospital. As her life hung in balance and Psalms were said in cycles in her name, I prayed for her recovery and once again acknowledged the terrifying journey that is childbirth—the miracles that both the baby and the mother must go through in order to bring down a soul into this world. The risk that we take as women is anything but selfish; we put our lives on the line to continue a chain of life. I held my breath until the following day, when her condition was announced as stable and she was on the road to recovery. Nine months postpartum, with my baby slowly starting to allow me to lead a life that has room for some of my own wants and desires, I look back at that day in the hospital where the word “failure” flashed across my mind again and again. I remember the old woman and her call of “You are blessed,” and I am finally able to accept those words and even to embrace them. I may never be “free” as long as I live, for I am bound by blood and by love to the people I have had the merit to create and nurture with the help of G‑d. They will always challenge me in different ways, at every stage. And although I may never be fully at liberty to do exactly what I wish when I want to, the gift of children and the challenges they have afforded me can only make me stronger, wiser, better. Truly, as the old woman told me that day, I am blessed. Blumie Abend is a freelance writer living in Los Angeles, California. She is a mother and teacher and uses her life experiences as a backdrop to her articles. Loaned my copy to Lubavitch rabbi when his wife had baby--close to 30 years ago..